Most of the times, people worry about replacing a tooth, if a tooth is lost. Every day, we brush, and floss, and rinse and do whatever we can do in order to keep our teeth healthy. The idea is not to lose a tooth and to replace teeth if we lose them for any reason. On rare occasion, we do want to lose a tooth and not replace it with another one. This is the case of impacted wisdom teeth. First, wisdom teeth are the last back teeth (molars) in our jaws, the ones far back in your mouth. They usually came out between the ages of 17 and 25. Most of us will have four wisdom teeth; two in each jaw (upper and lower) jaw, each of those wisdom teeth comes at the end of the set of our teeth on both sides. Some people are born without wisdom teeth, or with fewer than four in their mouth. When tooth is “stuck” in the jaw bone/gums; and cannot erupt completely, it is called “impacted” tooth. Sometimes, teeth other that the wisdom teeth can be impacted. These are often upper canines, small (lateral) incisors and other teeth. In today’s blog, we will focus our attention on impacted wisdom teeth as they are often cause for tooth pain. Our jaws sometimes cannot accommodate all of our teeth, especially lined up in a nice straight line. It is possible that some of us will inherit a slightly smaller jaw and slightly bigger teeth from our parents and ancestors. That is right, yet another thing you can blame your parents J. As a result, the wisdom teeth, which are typically the last one to erupt, simply do not have enough space and they are “stuck”. Here are few facts about impacted teeth. The wisdom teeth can be completely stuck in the bone, and that is called “fully impacted wisdom teeth”. Sometimes, they get out partially but they cannot completely erupt and they are therefore sticking out partially in the mouth. Those are called “partially impacted” teeth. Either way, this can be painful. Teeth can grow and try to come out at a wrong angle. They can press against other teeth or areas in the mouth and cause damage and pain. They are notoriously difficult to clean so much more prone to periodontal disease and decay. Dentist will detect the impacted teeth on x-rays. 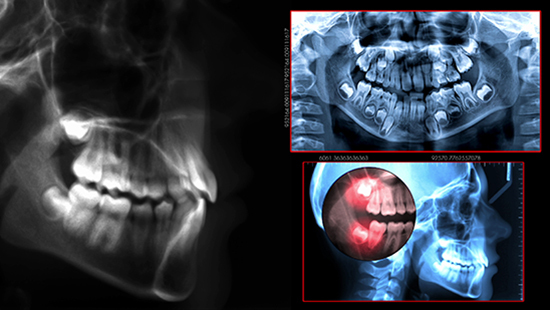 Sometimes, additional, bigger x-rays, called panoramic x-rays are necessary in order to see the impacted teeth. In addition, 3-D scans, like CT scans may be required in order to determine the exact position of impacted teeth, especially in relation to other vital structures, like nerves, vessels, sinus cavity etc. In case of partially impacted teeth, sometimes the gums around it are inflamed and swollen as food and bacteria are trapped below the gums, causing an infection. Dentists can deliver first aid, cleaning and debriding the area gently, prescribing antibiotics and pain medication. Bear in mind, this may be very temporary solution. Pain medication and antibiotics, as indicated. If wisdom teeth removal is necessitated, your dentist can sometimes do it. This depends on the level of training, skills and affinity of the dentist. However, most of the times, especially when fully impacted teeth need to be removed, the choice is an oral surgeon. Oral surgeons are extensively trained in many procedures and wisdom teeth extraction is one of the most commonly done procedures in the oral surgeon’s office. Here is a short case scenario of the process. Preoperative appointment with the oral surgeon. Discuss the type of anesthesia you will have. Oral surgeons can put you asleep during the procedure as well, or they can perform it under a local anesthesia. Make sure you ask any questions you have about before, during and post-surgery. Make sure you plan ahead of time to take days off work, arrange child or pet care as you may be required to rest at home after the surgery. Local anesthesia: your dentist/oral surgeon will use a shot of anesthetic in your gums to numb the area. Laughing gas: nitrous oxide is sometimes used in addition to the local anesthesia to make you feel relaxed and comfortable during the procedure. IV sedation: also called ‘conscious sedation” is also used during these procedures. Only licensed practitioners who have a special license for this kind of sedation can perform this. The sedation is delivered through a needle that is connected to your arm typically and the drugs used are mixture of medication that make you very sleepy and relaxed. The name “conscious sedation” describes the actual state of sedation; patients are typically down, but still responsive and conscious. The good part: most of the medications used cause amnesia so you would most likely not remember anything about the procedure. General anesthesia: you are under completely, asleep the whole time and wake up after an hour or so following the procedure. The medications are delivered either through a mask, intravenously 9needle in your arm), or a combination of both. First, it is the effect of anesthesia. We all respond differently to this. If you had only local anesthesia and you feel alert, you can even drive home and start your recovery. If you had IV sedation or general anesthesia, or after a particularly long and difficult procedure, you should not drive. In fact, in such cases, the doctor’s office will not allow you to get up and leave without a driver present. Most people have little to no pain after surgery. You may have swelling, sometimes quite extensive for 2 or 3 days. Some bleeding (oozing) from the wound is also possible so do not panic if you see little pink in your spit. If you see clear blood, especially difficult to stop, call your doctor. Use moist heat to prevent soreness of your jaws. Exercise your jaw; gently open and close several times a day. Drink plenty of fluids; no sodas. Gentle brushing of the other teeth after day 2 or 3. Call your doctor if you have a fever, severe bleeding, pain or swelling that does not improve. Don’t rinse your mouth too vigorously. Don’t eat tough, brittle, or sticky foods. At Imperial Dental Center, your Sugar Land dental office, we take pride in our comprehensive exam and treatment we provide for our patients. Dr. Angelova will check for any signs of impacted teeth, especially if any symptoms are present. As mentioned, the impacted teeth are not always visible on regular dental x-rays. Our office is in possession of a panoramic x-ray machine so bigger x-rays will be done to determine the position of the wisdom teeth. We collaborate with top oral surgeons on daily basis, in case referral to oral surgeon is indicated.